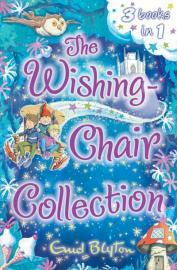 The famous Wishing Chair Collection has been released again with three books in one. It contains The Adventures of the Wishing Chair, The Wishing Chair Again, and The Wishing Chair Stories. The print is larger and darker in the first book then goes into a smaller and lighter text as the adventures progress. The black and white illustrations are interspersed throughout the book to reinforce the characters and their actions. The ever-popular Peter and Mollie with their best friend, Chinky the Pixie whom they saved from the giant’s clutches, are alive on the pages. They go on delicious, exciting and unusual adventures on their wishing chair, a rare object they discovered in an antique shop while searching for a gift for their mother’s birthday. On their travels they come into contact with, and are set upon by, mischievous goblins, gnomes, brownies, giants, elves, and various other magical and frequently more than kind and friendly creatures. It is in the first book that we are introduced to the children and follow them as they discover the wishing chair, where they meet and befriend Chinky, and discover how they keep the chair a secret and hidden in their playroom at the bottom of the garden. Their adventures begin at a command from the children or other occupant, and take place on visits home from school during holidays and during any visits home. These adventures aren’t always good ones. Many times the three find themselves embroiled in trouble and are forced to turn to Chinky for help, and he in turn depends on his countless connections and his magic wand to get them all out of sticky situations. They learn many lessons on their travels. They discover that everyone is not always to be trusted, and things are not always what they seem; that goodness is found in the most unexpected people and that kindness usually is the best tool in a difficult situation. Most of Enid Bytom’s books continue to be published and their popularity never wanes. These re-issues enable new readers –young and older ones- to escape into the magical and mythical adventures born so many years ago. This series is suitable and highly recommended for anyone five years and onwards.